SAULT STE. MARIE – Following their fourth consecutive Friday night shutout, the Lake Superior State Lakers chased the goaltender who shut them out in a 5-3 win. The Lakers (6-16-4, 4-11-3 WCHA) scored three first period goals against Darren Smith, who was pulled after one period of play in favour of Justin Kapelmaster. Gage Torrel got the scoring started for Lake Superior when his shot got past Smith, who was screened by Hampus Erikkson. Jake Hand and Anthony Nellis joined the fun, helping the Lakers to open up a 3-0 lead. In the second period, with Kapelmaster keeping the Lakers off the board, including a penalty shot by Alex Ambrosio, the Bulldogs forged a comeback, as Trevor Recktenwald cut the Lake Superior lead to two after 40 minutes of play. Initially reviewed to see if the play was onside, the goal stood when the replay failed to overturn the call on the ice. Early in the third, Ferris State (10-15-1, 7-10-1 WCHA) pulled within one when Ryker Killins got the puck through a pileup in front of Nick Kossoff. Like Recktenwald’s goal, this one had to go to the booth for review, but also came back good. Under a minute later, the game was tied on Justin Tackett’s first goal of the year. A long shot from Mitch Maloney was deflected by Tackett past Kossoff for a 3-3 score. With under 9:00 left to play, Diego Cuglietta came streaking into the zone and took a shot on net. Kapelmaster made the save, but a rebound escaped to the side, which Cuglietta slid back to the blueline. Kyle Chatham teed up the puck and shot it thru a crowd of players and found the back of the net, putting the Lakers back on top. 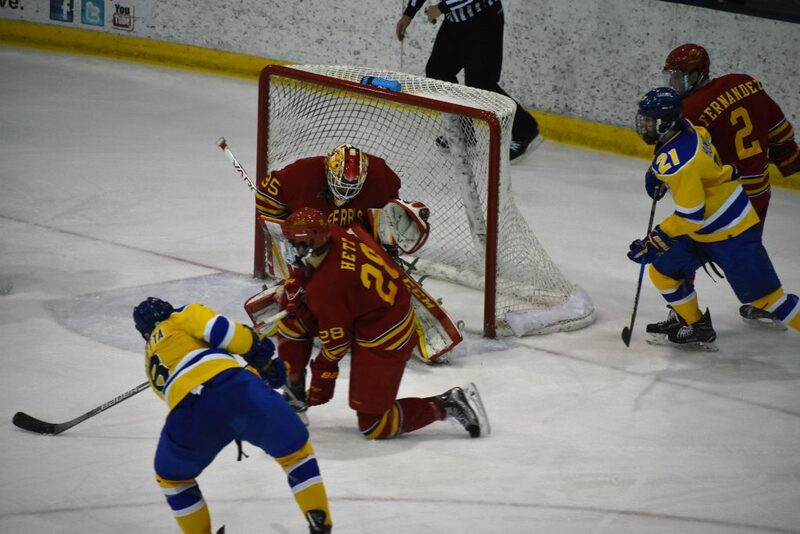 Ferris State had its chances, but Kossoff kept the puck out of the net the rest of the way. With the goalie pulled, Brayden Gelsinger notched his sixth goal of the season with an empty netter for a 5-3 final. In goal, Kossoff made 20 saves on 23 shots. Across the ice, Smith stopped 8 of 11 before Kapelmaster came in, who made 16 saves on 17 shots. The Lakers hit the road next weekend for Marquette. Northern Michigan (13-10-3, 11-5-2-2 WCHA), who swept Bowling Green this past weekend, has been the biggest surprise in the WCHA this year under new head coach Grant Potulny.